Those who can, teach. But what about those who can teach, but can’t afford to? Shaping young minds is one of the most important jobs in the country, and while the array of financial support looks really comprehensive at a quick glance, figuring out exactly what you’re eligible for means the numbers don’t always stack up. Fortunately, we’re here to help, looking at the loans, bursaries and other funding strategies required to see you through your Postgraduate Certificate of Education. Your year-long lesson plan starts here. 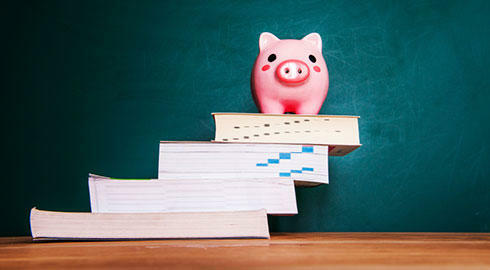 A PGCE is one of the postgraduate courses eligible for Student Finance. This means that a tuition fee loan from the government is payable directly to the university in exactly the same way as an undergraduate tuition loan. You’ll be paying the loan back at a small interest rate and won’t begin to do so until you’re earning. Student finance may also include a maintenance loan of around £3000. However, if you’re an international student, the availability of Student Finance becomes trickier, and you’ll need to phone them up to ensure that you’ll be eligible to apply for full student finance. The other route to go down is the Career Development Loan, offered by most major banks. However, the rate of interest is often much higher than Student Finance, clocking in with some banks at a very high 9.1% APR, so this option must be looked at with a fair degree of scrutiny to ensure it’s right for you. Although the Learning and Skills Council pay any interest on your loan during your study, this ceases once your full-time year is completed regardless of whether you’re employed. A bursary is a chunk of money paid to you without needing to be paid back, and is to some one of the main attractions of postgraduate teacher training – that financial incentive to get yourself going. The most common bursary is from the National College of Teaching and Leadership and acts as either a one-time payment, or for the higher ones, a monthly incentive. The amount you’re eligible to receive as part of the bursary depends on two factors: what you got at undergraduate and what you studied in. Physics and Maths are prioritised over all, and students that completed their degrees with firsts are eligible to receive £30,000 in funding to help them go to the schools of their choice. Someone with a 2:1 in English Literature, in comparison, will receive £4,000. Before Student Finance was available to postgraduates, this difference was often a reason to avoid postgraduate study. Fortunately, for those eligible to get Student Finance, this now serves as a little extra incentive and could prevent the need to take a maintenance loan at all. For some, area-specific funding options are feasible, but these largely depend on your nationality. In Wales, for example, those happy to teach in the Welsh language may be eligible for more support through the Welsh Median Improvement Scheme – in the 2015/16 academic year, this was an additional £1600 to £2000. In Scotland, Living Cost loans can be drawn up to a maximum of £4,500 from Student Finance Scotland. Those coming in from remote areas may also be provided with additional funding: dedicated awards for students from areas such as Guernsey or the Isle of Man are available for students willing to go and study on the mainland. For those that don’t want to study full-time, another option is to take a School Direct course, in which you are employed, with a salary, as an unqualified teacher. You’ll be conducting your studies alongside your new job, so it’s a lot to take on, but some students prefer it as they feel better prepared as a result of learning on the job. Salary depends on the school, but some schools will pay as much as £25,000 a year for a School Direct student to train in maths or physics. Non-salaried School Direct is also an option, and for this you will train in at least two different schools and may be eligible for further student funding via Student Finance. It’s an excellent networking opportunity despite the high workload. Make sure you check with your schools whether the Initial Teaching Training qualification received from the School Direct course actually includes a PGCE – most do, but not all, as some prefer to offer equivalent qualifications.